There is increasing evidence that inflammatory mechanisms other than eosinophilic inflammation may be involved in producing the final common pathway of enhanced bronchial reactivity and reversible airflow obstruction that characterises asthma. A review of the literature has shown that, at most, only 50% of asthma cases are attributable to eosinophilic airway inflammation. It is hypothesised that a major proportion of asthma is based on neutrophilic airway inflammation, possibly triggered by environmental exposure to bacterial endotoxin, particulate air pollution, and ozone, as well as viral infections. If there are indeed two (or more) subtypes of asthma, and if non-eosinophilic (neutrophil mediated) asthma is relatively common, this would have major consequences for the treatment and prevention of asthma since most treatment and prevention strategies are now almost entirely focused on allergic/eosinophilic asthma and allergen avoidance measures, respectively. It is therefore important to study the aetiology of asthma further, including the underlying inflammatory profiles. The prevalence of asthma is increasing worldwide, but the reasons for the striking increases are unclear.1 The pathophysiological mechanisms involved in the development of asthma are also not completely understood. Asthma is known to involve a heterogeneous airway inflammatory response where many cells play a part.2 In recent decades allergic mechanisms have been closely studied and defined. Consequently, asthma has almost universally been regarded as an atopic disease involving allergen exposure, allergic (IgE mediated) sensitisation with a Th2 CD4+ lymphocyte response and subsequent IL-5 mediated eosinophilic airways inflammation, resulting in enhanced bronchial reactivity3 and eventually in reversible airflow obstruction (asthma). Recent studies using sputum induction and/or bronchoalveolar lavage (BAL) techniques to measure and characterise airways inflammation in asthmatic subjects have shown that at least some, and potentially a substantial proportion, of cases have an underlying pathology that is clearly different from that observed in “classic” allergic asthma.18–24 Specifically, patients are observed to have severe and persistent asthma in the absence of eosinophilic inflammation, and may experience an exacerbation of asthma without an increase in eosinophilic inflammation.24 In addition, it is well known that non-allergic asthma is quite common in occupational populations.25 These studies, from a variety of different laboratories, clearly demonstrate the existence of non-eosinophilic asthma. This raises the question as to the role of non-allergic inflammatory mechanisms in the pathophysiology of asthma, and whether these may be involved in a substantial proportion of asthma cases in the general population. In this review we try to quantify the contribution of non-eosinophilic asthma in the general population, to explore whether non-allergic occupational asthma can be used as a model for this type of asthma in the general population, and discuss potentially relevant exposures and mechanisms that may result in non-eosinophilic asthma. We consider “atopy” as IgE mediated sensitisation to “common allergens” such as house dust mite, pet, and various food allergens. Atopy is usually assessed by skin prick tests or specific serum IgE measures of sensitisation to common allergens. However, a positive test only indicates that a subject is sensitised against a common allergen but does not constitute proof that symptoms experienced by the subject are caused by allergic (IgE) mediated mechanisms. We consider asthma as a heterogeneous chronic inflammatory disorder of the airways involving airflow limitation that is at least partly reversible and which results in recurrent episodes of symptoms such as wheezing, breathlessness, chest tightness, and cough.2 We define eosinophilic asthma as symptomatic airway inflammation characterised by the presence of eosinophils in the airways. Non-eosinophilic asthma then represents symptomatic asthma in the absence of eosinophilic airway inflammation. This definition, based on the underlying pattern of airway inflammation, can now be studied relatively easy using sputum induction techniques.26,27 Eosinophilic inflammation is generally considered to be the main feature of allergic asthmatic airways and is presumed to be crucial in the pathogenesis of allergic asthma.28 In addition to eosinophils, interleukin (IL)-5 and possibly IL-4 play a key role in allergic asthma (IL-5 stimulates the growth, differentiation and activation of the eosinophils, and IL-4 stimulates B cells to IgE production and naïve Th0 cells to differentiate toward a Th2 state), and thus increased levels of IL-5 and IL-4 (in combination with raised eosinophil levels) may be used as other “specific” markers. Using the classification described above (based on the presence or absence of eosinophils in bronchial biopsy specimens, BAL fluid, or sputum), we have attempted to quantify the proportion of non-eosinophilic asthmatics in the general population. However, previous studies on airways inflammation have been conducted mainly on selected populations—that is, subjects attending asthma clinics, severe asthmatics, atopic asthmatics, asthmatics with bronchial hyperreactivity (BHR), etc—and only a few were conducted in a random sample of asthmatic subjects. These studies therefore give only a crude estimate of the proportion of asthma which is non-eosinophilic in selected populations. For the purpose of this review we have selected from Medline studies from 1995 onwards with data on eosinophil levels in biopsy specimens, BAL fluid, or sputum of asthmatic subjects where the subjects were not clearly selected on the basis of atopic characteristics (positive skin prick tests or IgE determinations), and where data were presented so that the subjects could be classified as eosinophilic or non-eosinophilic asthmatics. Cut off values used to define eosinophilic and non-eosinophilic asthma were the same as those reported in the original studies (2–4%) or, when the authors did not define a cut off level, we used 2% based on the upper normal limit for eosinophil counts in sputum as previously published.29,30 Table 1 summarises the proportion of asthmatic subjects with eosinophilic inflammation for all eligible studies. The weighed mean proportion of subjects with eosinophilic asthma was 51%, so 49% had non-eosinophilic asthma. Exclusion of infant wheezers19 who may not be truly asthmatic did not significantly change the overall estimate (52% versus 51% eosinophilic asthma). This estimate of the percentage of asthmatics that are “attributable” to eosinophilia is probably an overestimate since non-asthmatic control subjects may have eosinophilia as well, and thus not all asthmatic subjects with eosinophilia necessarily have asthma due to eosinophilia (just as not all asthmatic subjects with atopy have asthma due to atopy4). Only six studies reported findings for non-asthmatic controls. In two studies 20% of the non-asthmatic controls had increased eosinophil levels,19,20 in one 9.4% had increased sputum eosinophil levels,42 and in the other three studies none of the controls had raised sputum eosinophil levels.23,31,35 For the studies with 20% and 9.4% eosinophil positive controls we calculated the population attributable risk (PAR)4 to estimate the true proportion of asthma cases that were attributable to eosinophilia. The PARs for the study by Gibson et al20 were 26% and 51%, respectively, compared with the crude estimates (the proportion of asthmatics with eosinophilia) of 41% for children with current symptoms and 62% for children with BHR. The PAR for another recent study by Gibson et al42 in children with current wheeze was 36% compared with a crude estimate of 45%, while in the study by Marguet et al19 the PAR was 46% compared with a crude estimate of 57% (for children). This suggests that our estimate of 49% of non-eosinophilic asthma is conservative. On the other hand, the figure of 51% for eosinophilic asthma would be an underestimate (and the figure of 49% for non-eosinophilic asthma would be an overestimate) if a significant proportion of eosinophilic asthmatic subjects did not have eosinophilia at the time they were studied, either because of treatment with corticosteroids or because they had no current symptoms. However, as shown in table 1, the percentage was still relatively low even in asthmatic subjects who were not receiving corticosteroids. Also, the proportion of eosinophilic asthmatic subjects was equally “low” in those with current symptoms (table 1), indicating that this hypothesis was unlikely to account for our findings. It is striking that in most studies non-eosinophilic asthma was associated with increased neutrophil and IL-8 levels,18,19,21,36,43,44 which suggests that non-allergic neutrophil driven airways inflammation was the underlying mechanism for non-eosinophilic asthma. Interestingly, the inflammatory profile appears to be very similar to that described for non-eosinophilic occupational asthma (see below), and is consistent with activation of innate immune mechanisms mediating the inflammatory process in non-eosinophilic asthma (fig 1). Acquired and innate immune pathways leading to IL-5 mediated eosinophil (Eos) inflammation (acquired pathway) or IL-8 mediated neutrophil (Pmn) inflammation (innate pathway) and subsequent asthma. Receptors for triggers (FcRI, FcRII, TLR4, CD14) and transcription factors (NFAT, API, GATA, NF-κB) are shown as intermediate steps. Ozone is a powerful oxidant and air pollutant that has been shown to exacerbate pre-existing asthma,78–83 but some evidence from large epidemiological studies has been presented that suggests a role for ozone also in the primary causation of asthma.84–86 Similarly, particulates such as diesel exhaust increase asthma symptoms, induce neutrophilic airways inflammation,64 and promote neutrophil mobilisation from the bone marrow.65 These responses are most probably mediated by NF-κB activation and IL-8 secretion.87 Thus ozone, particulates, and endotoxin have the potential to induce asthma by non-allergic mechanisms and, while they are commonly present in increased concentrations in the environment, they may contribute to the development of non-eosinophilic asthma in the general population. The common pathophysiological features of non-eosinophilic asthma involve an IL-8 mediated neutrophil influx and the subsequent neutrophil activation is a potent stimulus to increased airway hyperresponsiveness.91 Although the stimuli that trigger this response are diverse (endotoxin, ozone, particulates, virus infection), the common features are consistent with activation of innate immune mechanisms rather than IgE mediated activation of acquired immunity. Recent data indicate a role for Toll-like receptors (TLR) and CD14 in this process.92 TLRs can recognise a large variety of chemically diverse stimuli which then trigger proinflammatory responses involving NF-κB activation and chemokine production93,94 characteristic of non-eosinophilic asthma (fig 1). We have previously shown that atopic mechanisms may account for, at most, “only” 40% of cases of asthma in the general population.4 Interestingly, in this review we have shown that, at most, “only” 50% of all asthma cases are attributable to eosinophilic airway inflammation. Thus, evidence from studies of eosinophilia and asthma is consistent with that from studies of atopy and asthma: in both instances, at most about 50% of asthma cases appear to be due to “allergic” mechanisms (whether these are defined in terms of atopy or in terms of eosinophilia). This further adds to the evidence that allergic mechanisms may not be the only and/or necessarily the most important underlying mechanism for asthma. Non-eosinophilic asthma is associated with neutrophilic responses not only in severe asthmatics but also in those with moderate and mild asthma, and we thus hypothesise that a major proportion of asthma is based on neutrophilic airway inflammation. Environmental exposure to bacterial endotoxin, particulate air pollution, and ozone, as well as viral infections, may play an important role as triggers of neutrophilic airway inflammation in asthma. The inflammatory picture in surveys of the general population appears to be very similar to that observed in non-allergic asthma in occupational populations which thus may serve as a suitable model for non-allergic asthma in the general population. It is not clear whether neutrophilia develops as a primary pathological process (as is the case in occupational non-allergic asthma) or is secondary to high doses of inhaled corticosteroids (ICS) that are known to prolong the survival of neutrophils96 and to reduce eosinophil survival.97 One study38 seems to confirm the latter hypothesis to a certain extent; after cessation of treatment with ICS the percentage of eosinophils increased significantly in seven of 20 subjects with recurrent symptoms but only marginally in the 13 subjects without recurrence of asthma symptoms (not significant). Furthermore, two studies31,37 indicated a lower proportion of eosinophilic asthmatic subjects in those receiving ICS. However, in these two studies the prevalence was still relatively low even in those who did not receive treatment with ICS (67% and 29%, respectively). In addition, in the study by Gibson et al20 only six of the 56 asthmatic children were on ICS but the percentage of eosinophilic asthma was “only” 41%. In the study by Ottanelli et al39 no difference was seen in the mean proportion of eosinophils in the obstructed ICS naïve and ICS treated asthma patients. Finally, several other studies24,43 showed that corticosteroid treatment was unlikely to explain the differences in inflammatory responses since no difference in treatment existed between the groups with and without increased bronchial eosinophilic cells. However, regardless of the exact mechanisms involved, neutrophils appear to be important in the pathophysiology of asthma, both in occupational populations and in the general population. The features suggest a common mechanism involving activation of innate immune responses in the generation of chemokine release and neutrophil influx. Our focus has been on assessing the relative importance of non-eosinophilic mechanisms for asthma and on the need for more research into what these mechanisms may be. Nevertheless, on the basis of current evidence it is tempting to speculate that most non-eosinophilic asthma is neutrophil mediated, in contrast to allergic asthma which is eosinophil mediated. If there are indeed two (or more) subtypes of asthma as hypothesised, and if non-eosinophilic (neutrophil mediated) asthma is relatively common, this would have major consequences for the treatment and prevention of asthma since most treatment and prevention strategies are now almost entirely focused on allergic/eosinophilic asthma and allergen avoidance measures, respectively. It is therefore important to study the aetiology of asthma further, including the underlying inflammatory profiles. Furthermore, since little is known about the prognosis of both types of asthma, future studies need prospective evaluation. A better understanding of the underlying mechanisms will also provide a firmer basis for new theories to explain why there is a world wide increase in asthma, and would provide new insights into which factors determine primary causation of asthma. The current “hygiene hypothesis”, which is based on the assumption that a lack of certain exposures early in life (for example, infections) may enhance Th2 or atopic immune responses,74 can potentially only explain an increase in allergic but not of non-allergic asthma. Thus, with the large proportion of non-allergic asthma it is questionable whether the “hygiene hypothesis” (as defined above) on its own can explain the large increase observed over the last decades. The Centre for Public Health Research is funded by the Health Research Council of New Zealand. Jeroen Douwes is supported by a research fellowship from the Netherlands Organization for Scientific Research (NWO). Pearce N, Douwes J, Beasley R. The rise and rise of asthma: a new paradigm for the new millenium. J Epidemiol Biostat2000;5:5–16. Global Initiative for Asthma (GINA). Global strategy for asthma management and prevention. NHLBI/WHO Workshop Report. Washington DC: NIH, 1995. Cambell P, Weiss U, eds. Allergy and asthma. Nature1999;402:B1–38. Pearce N, Pekkanen J, Beasley R. How much asthma is really attributable to atopy? Thorax1999;54:268–72. Pearce N, Douwes J, Beasley R. Is allergen exposure the major cause of asthma? Thorax2000;55:424–31. Priftanji A, Strachan D, Burr M, et al. Asthma and allergy in Albania and the UK. Lancet2001;358:1426–7. Fahy JV, Fleming HE, Wong HH, et al. The effect of an anti-IgE monoclonal antibody on the early- and late-phase responses to allergen inhalation in asthmatic subjects. Am J Respir Crit Care Med1997;155:1828–34. Boulet LP, Chapman KR, Cote J, et al. Inhibitory effects of an anti-IgE antibody E25 on allergen-induced early asthmatic response. Am J Respir Crit Care Med1997;155:1835–40. Fahy JV, Cockroft DW, Boulet LP, et al. Effect of aerosolized anti-IgE (E25) on airway responses to inhaled allergen in asthmatic subjects. Am J Respir Crit Care Med1999;160:1023–7. Casale TB, Bernstein IL, Busse WW, et al. Use of an anti-IgE humanized monoclonal antibody in ragweed-induced allergic rhinitis. J Allergy Clin Immunol1997;100:110–21. Milgrom H, Fick RB Jr, Su JQ, et al. Treatment of allergic asthma with monoclonal anti-IgE antibody. Rhumab-E25 Study Group. N Engl J Med1999;341:1966–73. Salvi SS, Babu KS. Treatment of allergic asthma with monoclonal anti-IgE antibody. N Engl J Med2000;342:1292–3. Salvi SS. Glucocorticoids enhance IgE synthesis. Are we heading towards new paradigms? Clin Exp Allergy2000;30:1499–505. Mehlhop PD, van de Rijn M, Goldberg AB, et al. Allergen-induced bronchial hyperreactivity and eosinophilic inflammation occur in the absence of IgE in a mouse model of asthma. Proc Natl Acad Sci USA 1997;94:1344–9. Hamelmann E, Takeda K, Schwartze J, et al. Development of eosinophilic airway inflammation and airway hyperresponsiveness requires interleukin-5 but not immunoglobulin E or B lymphocytes. Am J Respir Cell Mol Biol1999;21:480–9. Hamelmann E, Cieslewicz, Schwarze J, et al. Anti-interleukin 5 but not anti-IgE prevents airway inflammation and airway hyperresponsiveness. Am J Respir Crit Care Med1999;160:934–41. Tournoy KG, Kips JC, Schou C, et al. Airway eosinophilia is not a requirement for allergen-induced airway hyperresponsiveness. Clin Exp Allergy2000;30:79–85. Gibson PG, Wlodarczyk JW, Hensley MJ, et al. Epidemiological association of airway inflammation with asthma symptoms and airway hyperresponsiveness in childhood. Am J Respir Crit Care Med1998;158:36–41. Gibson PG, Simpson JL, Saltos N. Heterogeneity of airway inflammation in persistent asthma: evidence of neutrophilic inflammation and increased sputum interleukin-8. Chest2001;119:1329–36. Jatakanon A, Uasuf C, Maziak W, et al. Neutrophilic inflammation in severe persitent asthma. Am J Respir Crit Care Med1999;160:1532–9. Turner MO, Hussack P, Sears MR, et al. Exacerbations of asthma without sputum eosinophilia. Thorax1995;10:1057–61. Bernstein IL, Chan-Yeung M, Malo JL, et al, eds. Asthma in the workplace. 2nd ed. New York: Marcel Dekker, 1999: 742 pp. Gibson PG. Use of induced sputum to examine airway inflammation in childhood asthma. J Allergy Clin Immunol1998;102:s100–1. Holt PG, Macaubas C, Stumbles PA, et al. The role of allergy in the development of asthma. Nature1999;402:B12–7. Pin I, Gibson PG, Kolendovicz R, et al. Use of induced sputum cell counts to investigate airway inflammation in asthma. Thorax1992;47:25–9. Berlyne GS, Efthimiadis A, Hussack P, et al. Sputum in asthma: color versus cell counts. J Allergy Clin Immunol1999;104:182–3. Wilson NM, Bridge P, Spanevello A, et al. Induced sputum in children: feasibility, repeatability and relation of findings to asthma severity. Thorax2000;55:768–74. Fahy JV, Kim KW, Liu J, et al. Prominent neutrophilic inflammation in sputum from subjects with asthma exacerbation. J Allergy Clin Immunol1995;95:843–52. Pavord ID, Ward R, Woltmann G, et al. Induced sputum eicosanoid concentrations in asthma. Am J Respir Crit Care Med1999;160:1905–9. Lemiére C, Pizzichini MMM, Balkissoon R, et al. Diagnosing occupational asthma: use of induced sputum. Eur Respir J1999;13:482–8. Tarodo de la Fuente P, Romagnoli M, Carlsson L, et al. Eosinophilic inflammation assessed by induced sputum in corticosteroid-dependent asthma. Respir Med1999;93:183–9. Ordoñez CL, Shaughnessy TE, Matthay MA, et al. Increased neutrophil numbers and IL-8 levels in airway secretions in acute severe asthma. Am J Respir Crit Care Med2000;161:1185–90. Wark PAB, Gibson PG, Fakes K. Induced sputum eosinophils in the assessment of asthma and chronic cough. Respirology2000;5:51–7. Giannini D, Di Franco A, Cianchetti S, et al. Analysis of induced sputum before and after withdrawal of treatment with inhaled corticosteroids in asthmatic patients. Clin Exp Allergy2000;30:1777–84. Ottanelli R, Rosi E, Romagnolio I, et al. Do inhaled corticosteroids affect perception of dyspnea during bronchoconstriction in asthma? Chest2001;120:770–7. Fahy JV, Boushey HA, Lazarus SC, et al. Safety and reproducibility of sputum induction in asthmatic subjects in a multicenter study. Am J Respir Crit Care Med2001;163:1470–5. Gibson PG, Norzila MZ, Fakes K, et al. Pattern of airway inflammation and its determinants in children with acute severe asthma. Pediatr Pulmonol1999;28:261–70. Gibson PG, Simpson JL, Chalmers AC, et al. Airway eosinophilia is associated with wheeze but is uncommon in children with persistent cough and frequent chest colds. Am J Respir Crit Care Med2001;164:977–81. Amin K, Lúdvíksdóttir D, Janson C, et al. Inflammation and structural changes in the airways of patients with atopic and nonatopic asthma. Am J Respir Crit Care Med2000;162:2295–301. Wenzel SE, Stanley JS, Leung DYM, et al. Bronchoscopic evaluation of severe asthma: persistent inflammation associated with high dose glucocorticoids. Am J Respir Crit Care Med1997;156:737–43. Schenker MB, D Christiani, Y Cormier, et al. Respiratory health hazards in agriculture. Am J Respir Crit Care Med1998;158:S1–76. Jacobs RR, Becklake B, van Hage-Hamsten M, et al. Bronchial reactivity, atopy, and airway response to cotton dust. Am Rev Respir Dis1993;148:19–24. Sepulveda M-J, Castellan RM, Hankinson JL, et al. Acute lung function respone to cotton dust in atopic and non atopic individuals. Br J Ind Med1984;41:487–91. Larsson BM, Palmberg L, Malmberg PO, et al. Effect of exposure to swine dust on levels of IL-8 in airway lavage fluid. Thorax1997;52:638–42. Clapp WB, Becker S, Quay J, et al. Grain dust-induced airflow obstruction and inflammation of the lower respiratory tract. Am J Respir Crit Care Med1994;150:611–7. Preller L, Doekes G, Heederik D, et al. Disinfectant use as a risk factor for atopic sensitisation and symptoms consistent with asthma: an epidemiological study. Eur Respir J1996;9:1407–13. Enarson DA, Vedal S, Chan-Yeung M. Fate of grainhandlers with bronchila hyperreactivity. Clin Invest Med1988;11:193–7. Becker S, Clapp WA, Quay J, et al. Compartmentalization of the inflammatory response to inhaled grain dust. Am J Respir Crit Care Med1999;160:1309–18. Jung KS, Park HS. Evidence for neutrophil activation in occupational asthma. Respirology1999;4:303–6. Lummus ZL, Alam R, Bernstein JA, et al. Diisocyanate antigen-enhanced production of monocyte chemoattractant protein-1, IL-8, and tumor necrosis factor-alpha by peripheral mononuclear cells of workers with occupational asthma. J Allergy Clin Immunol1998;102:265–74. Wright SD, Ramos RA, Tobias PS, et al. CD14, a receptor for complexes of lipopolysaccharide (LPS) and LPS binding protein. Science1990;249:1431–3. Ulmer AJ. Biochemistry and cell biology of endotoxins. Int J Occup Environ Health1997;3:s8–17. Douwes J, Heederik D. Epidemiologic investigations of endotoxins. Int J Occup Environ Health1997;3:s26–31. Michel O, Nagy AM, Schroeven M, et al. Dose-response relationship to inhaled endotoxin in normal subjects. Am J Respir Crit Care Med1997;156:1157–64. Anonymous. Health effects of outdoor air pollution. Committee of the Environmental and Occupational Health Assembly of the American Thoracic Society. Am J Respir Crit Care Med1996;153:3–50. Nightingale JA, Rogers DF, Barnes PJ. Effect of inhaled ozone on exhaled nitric oxide, pulmonary function, and induced sputum in normal and asthmatic subjects. Thorax1999;54:1061–9. Holtz O, Jorres RA, Timm P, et al. Ozone-induced airway inflammatory changes differ between individuals and are reproducible. Am J Respir Crit Care Med1999;159:776–84. Basha MA, Gross KB, Gwizdala CJ, et al. Bronchoalveolar lavage neutrophilia in asthmatic and healthy volunteers after controlled exposure to ozone and filtered purified air. Chest1994;106:1757–65. Torres A, Utell MJ, Morow PE, et al. Airway inflammtion in smokers and nonsmokers with varying responsiveness to ozone. Am J Respir Crit Care Med1997;156:728–36. Nightingale JA, Maggs R, Cullinan P, et al. Airway inflammation after controlled exposure to diesel exhaust particulates. Am J Respir Crit Care Med2000;162:161–6. Mukae H, Vincent R, Quinlan K, et al. The effect of repeated exposure to particulate air pollution (PM10) on the bone marrow. Am J Respir Crit Care Med2001;163:201–9. Salvi S, Blomberg A, Rudell B, et al. Acute inflammatory responses in the airways and peripheral blood after short-term exposure to diesel exhaust in healthy human volunteers. Am J Respir Crit Care Med1999;159:702–9. Nightingale JA, Rogers DF, Hart LA, et al. Effect of inhaled endotoxin on induced sputum in normal, atopic, and atopic asthmatic subjects. Thorax1998;53:563–71. Michel O, Ginanni R, Duchateau J, et al. Domestic endotoxin exposure and clinical severity of asthma. Clin Exp Allergy1991;21:441–8. Michel O, Kips J, Duchateau J, et al. Severity of asthma is related to endotoxin in house dust. Am J Respir Crit Care Med1996;154:1641–6. Rizzo MC, Naspitz CK, Fernandez-Cladas E, et al. Endotoxin exposure and symptoms in asthmatic children. Pediatr Allergy Immunol1997;8:121–6. Douwes J, A Zuidhof, G Doekes, et al. β(1→3)-glucan and endotoxin in house dust and peak flow variability in children. Am J Respir Crit Care Med2000;162:1348–54. Park JH, Gold DR, Spiegelman DL, et al. House dust endotoxin and wheeze in the first year of life. Am J Respir Crit Care Med2001;163:322–8. Holt PG, Sly PD, Bjorksten B. Atopic versus infectious diseases in childhood: a question of balance? Pediatr Allergy Immunol1997;8:53–8. Martinez FD, Holt PG. Role of microbial burden in aetiology of allergy and asthma. Lancet1999;354:12–5. Von Mutius E, The environmental predictors of allergic disease. J Allergy Clin Immunol2000;105:9–19. Gereda JE, Leung DYM, Thatayatikom A, et al. Relation between house-dust endotoxin exposure, type 1 T-cell development, and allergen sensitisation in infants at high risk of asthma. Lancet2000;355:1680–3. Douwes J, Pearce N, Heedrik D. Does environmental endotoxin exposure prevent asthma? Thorax2002;57:86–90. Lebowitz MD, Collins L, Holberg CJ. Time series analyses of respiratory responses to indoor and outdoor environmental phenomena. Environ Res1987;43:332–41. Kreit JW, Gross KB, Moore TB, et al. Ozone-induced changes in pulmonary function and bronchial responsiveness in asthmatics. J Appl Physiol1989;66:217–22. Weisel CP, Cody RP, Lioy PJ. Relationship between summertime ambient ozone levels and emergency department visits for asthma in central New Jersey. Environ Health Perspect1995;103:97–102. Scannell C, Chen L, Aris RM, et al. Greater ozone-induced inflammatory responses in subjects with asthma. Am J Respir Crit Care Med1996;154:24–9. Thurston GD, Lippmann M, Scott MB, et al. Summertime haze air air pollution and children with asthma. Am J Respir Crit Care Med1997;155:654–60. Jalaludin BB, Chey T, O'Toole BI, et al. Acute effects of low levels of ambient ozone on peak expiratory flow rate in a cohort of Australian children. Int J Epidemiol2000;29:549–57. Dockery DW, Speizer FE, Stram DO, et al. Effects of inhalable particles on respiratory health of children. Am Rev Respir Dis1989:139:587–94. Greer J, Abbey DE, Burchette RJ. Asthma related to occupational and ambient air pollutants in non-smokers. J Occup Med1993;35:909–15. McDonnell WF, Abbey DE, Naomi Nishino, et al. Long-term ambient ozone concentrations and the incidence of asthma in nonsmoking adults: The Ahsmog study. Environ Res1999;80:110–21. Kennedy T, Ghio AJ, Reed W, et al. Copper-dependent inflammation and nuclear factor-kappaB activation by particulate air pollution. Am J Respir Cell Mol Biol1998;19:366–78. Johnston SL. 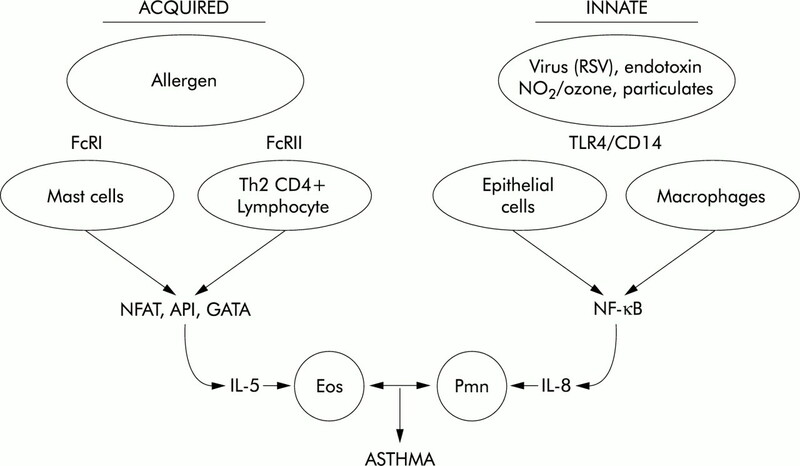 The role of viral and atypical bacterial pathogens in asthma pathogenesis. Pediatr Pulmonol Suppl1999;18:141–3. Nicholson KG, Kent J, Ireland DC. Respiratory viruses and exacerbations of asthma in adults. BMJ1993;307:982–6. Norzilla M, Fakes K, Henry RL, et al. IL-8 secretion and neutrophil recruitment accompanies induced sputum eosinophil activation in children with acute asthma. Am J Respir Crit Care Med2000;161:769–74. Anticevich SZ, Hughes JM, Black JL, et al. Induction of hyperresponsiveness in human airway tissue by neutrophils: mechanism of action. Clin Exp Allergy1996;26:549–56. Reed CE, Milton DK. Endotoxin-stimulated innate immunity: a contributing factor for asthma. J Allergy Clin Immunol2001;108:157–66. Kurt-Jones EA, Popova L, Kwinn L, et al. Pattern recognition receptors TLR4 and CD14 mediate response to respiratory syncytial virus. Nature Immunol2000;1:398–401. Kleeberger SR, Reddy SP, Zhang LY, et al. Toll-like receptor 4 mediates ozone-induced murine lung hyperpermeability via inducible nitric oxide synthase. Am J Physiol Lung Cell Mol Physiol2001;280:L326–33. Cox G. Glucocorticoid treatment inhibits apoptosis in human neutrophils: separation of survival and activation outcomes. J Immunol1995;154:4719–25. Woolley KL, Gibson PG, Carty K, et al. Eosinophil apoptosis and the resolution of airway inflammation in asthma. Am J Respir Crit Care Med1996;154:237–43.